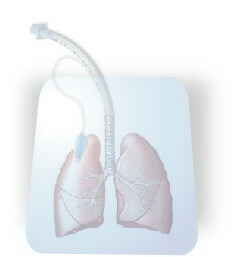 Lung transplantation (LTX) is a successful therapy that palliates patients with a variety of end-stage lung diseases. Unfortunately, access to LTX is severely limited by an inadequate number of suitable lungs from conventional organ donors. Normally, organs for transplant are retrieved from a brain-dead donor following controlled cardiac arrest in an operating room ï¿½ this is a ï¿½conventionalï¿½ organ donor. Unfortunately, many conventional organ donors have severe lung infection or pulmonary edema, and so often lungs are not suitable for transplant. There has been some interest in non-heart-beating donors (NHBDs) as a source of organs for transplant, but enthusiasm has been hampered by the requirement to minimize graft ischemic time (the time without blood flow). However, among transplanted organs, the lung may be ideally suited to retrieval from NHBDs, because the lung is the only solid organ transplanted that does not rely on blood perfusion for oxygenation. Respiration for lung parenchymal cells occurs via air spaces, and perfusion of the pulmonary capillary bed may represent an ï¿½oxygen stealï¿½. Thus, lung tissue remains viable for substantial periods of time after circulatory arrest, in contrast to other solid organs. Thus, lungs may be suitable for transplant, even if recovered from deceased individuals hours after circulatory arrest and death. This hypothesis is supported by the observation that pulmonary epithelial cells can be cultured from morgue specimens and considerable experimental data. If lungs could be retrieved from non-heart-beating donors, the critical shortage of lungs for transplant could be alleviated. An obstacle to this approach is the inability to predict these lungsï¿½ suitability for transplant. 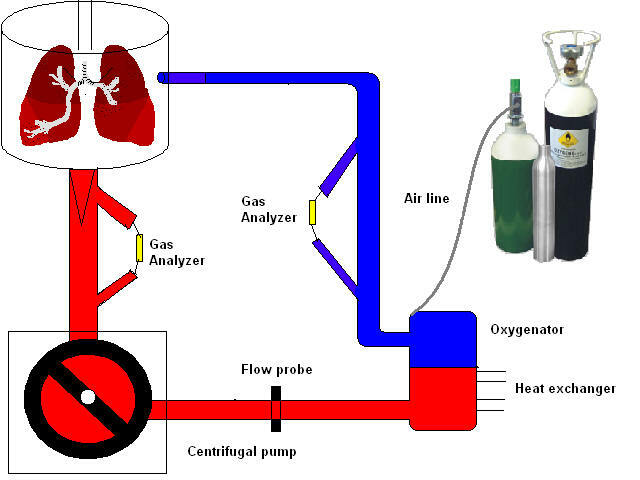 We have thus developed a method to perfuse and ventilate human lungs ex-vivo to assess gas exchange and vascular resistance, and to perform bronchoscopic inspection, and radiographic evaluation. Human lungs were retrieved after cold Perfadexï¿½ flush, stored cold for 6-13 hours, then perfused and rewarmed in a modified cardio-pulmonary bypass circuit. Circuit perfusate was buffered colloid/crystalloid containing type-specific leukocyte-filtered blood (hematocrit of 10-12%), circulated through a membrane oxygenator ventilated with CO2 and nitrogen to deoxygenate it. Lungs were ventilated with FiO2 0.5 when 32ï¿½C was reached. Gas exchange and vascular resistance was assessed at 5 l/min flow at 37ï¿½C, FiO2 0.5 & 1.0. Bronchoscopy, plain radiographs and spiral CT scans were performed. Lung biopsies were obtained pre- and post-reperfusion. Click here to see CT scans of lungs used in our experiment. Click on the picture to the right to see a video of the ex-vivo circuit in action!